A broad movement uniting war veterans, nationalist bikers and conservative politicians has been launched in Moscow to oppose the so called ‘color revolutions’ – changes of political regime through street protests rather than elections. The movement was introduced by one of its founders, deputy head of the Combat Brotherhood veterans’ group, Dmitry Sablin at a conference. Other key members include deputy head of the majority United Russia parliamentary caucus Franz Klintsevich, co-chairman of the Great Fatherland party Nikolai Starikov and Aleksandr Zaldostanov, the leader of the Night Wolves motorcycle club, known for its support for President Vladimir Putin and Russian national interests. Movement members are using ‘anti-Maidan’ to describe it. The term comes from the Ukrainian word maidan that means city square, but is now used to describe the street protests and clashes with police that eventually led to the ousting of President Yanukovich of Ukraine last year. “Maidan has not appeared in Ukraine in one day. It was unwound gradually, step by step. People received money for participation as well as for every thrown cobblestone or bottle. We understand that the processes are now taking place in Russia is just a testing step for a similar process,” Sablin said at the founding conference. “We also understand that all street movements and colored revolutions lead to bloodshed. And children, women and elderly people are the first to suffer. Of course we will oppose this movement at every step,” the activist added. 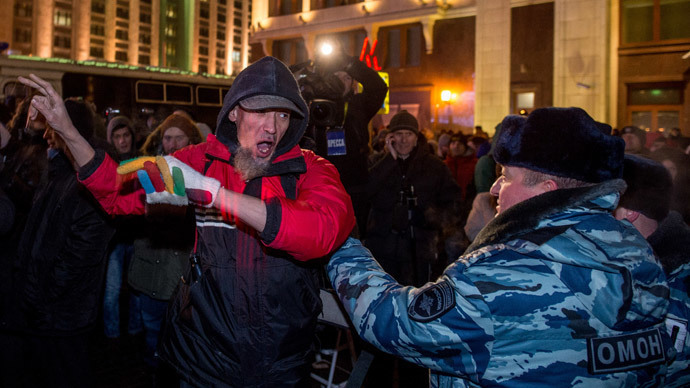 The first meeting of the anti-Maidan activists took place on the same day as a demonstration in central Moscow’s Manezhnaya square. The idea was to counter supporters of the famous anti-corruption blogger-turned opposition politician Aleksey Navalny, who wanted to protest against the suspended sentence for embezzlement handed down on him in late December. According to police reports there were 500 protesters, and conservative activists outnumbered Navalny supporters nine to one. About 10 people were detained for public order offences and taken to the nearest police stations. “We will just look each other in the eye, look in the eyes of the young people who fall victim of deception,” Sablin said, describing his movement’s preferred tactics. “We will be there to make sure that other people are not violating any laws when they express their opinion. And also to demonstrate an opposite position, the majority position and the position of the people on behalf of which the opposition is trying to speak,” he emphasized. Nikolai Starikov added in press comments that the new movement would also launch several propaganda projects that would explain to ordinary people that behind the attractive slogans used by the opposition there is nothing but a desire to split Russia into several parts that would be small and weak. It should be noted, however, that the first success of the new movement can be explained by the fact that earlier this month Navalny called upon his supporters to change the time of protests from mid-January to mid-February as this could supposedly give the various opposition movements more time to work out a unified position.